Will Smith is a man who never seizes to amaze us and this time we dropped our mouth wide open when we heard how he had celebrated his fiftieth birthday. It seems like Will Smith is a real daredevil and enjoys extreme sports but is that really true? The A-list actor, Will Smith celebrated his fiftieth birthday by bungee jumping out of the helicopter flying over the Grand Canyon. Will’s entire family stood by his side as he prepared to take this huge leap. Will and his wife Jada Pinkett Smith, daughter Willow Smith and sons Trey and Jaden Smith arrived in a camper van which has a certain nostalgic value for the Men in Black actor. He explained it everything in an interview prior to the jump given by a fellow star from Fresh Prince of Bel-Air, Alfonso Ribeiro. Smith explained how he came to the Grand Canyon with his family for the first time in 1976, also in a camper, but he was paralyzed with fear from the height. Fear was always a dominant emotion throughout his childhood and always pooled him back. This is why he decided to fight his demons and do the jump. This whole thing started as a dare from Yes Theory whose main motto is that life is the most fulfilling and authentic while we’re willing to seek discomfort. They promote the idea of getting out of your comfort zones and facing your fears in order to grow. Will Smith definitely accepted the challenge and nailed it. Although you may not be the fan of bungee jumping, you have to give him some credit for this undertaking.Doing a bungee while attached to a helicopter added an extra element of danger because the helicopter is constantly moving. The 50 year-old actor updated his social media followers on regular basis leading up to the epic jump. He posted a family photo captioned “My Squad holding me down for my big 5-0. “Will Smith really knows how to celebrate in style. 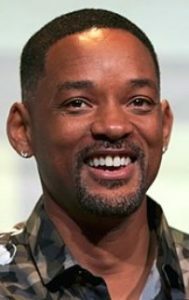 The video of Will Smith jumping out from a helicopter can be found on his YouTube channel and all we can say is “Happy Birthday”.